HeadVape’s Nano starter kits comes with everything you need to start vaping. Kit includes a mini clearomizer, a USB charger, battery and a 5ml bottle of e-juice. 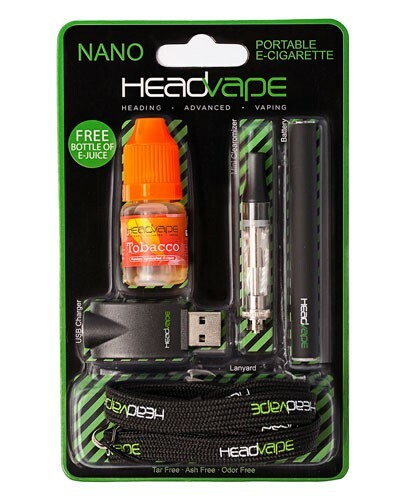 HeadVape e-juice is made in the U.S.A. containing 12mg of nicotine. The HeadVape Nano's elegant size is ideal for those looking for a discreet vaporizer or e-cigarette device. No button to push and complete control over the flavor and strength of nicotine within the replaceable high powered Nano tank. 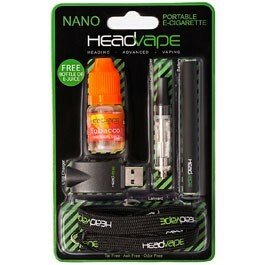 Averaging over 300 puffs per charge, the HeadVape Nano will keep you vaping all day and night.